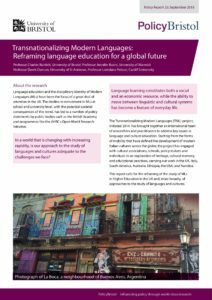 The Transnationalizing Modern Languages (TML) project, initiated 2014, has brought together an international team of researchers and practitioners to address key issues in language and culture education. Starting from the forms of mobility that have defined the development of modern Italian cultures across the globe, the project has engaged with cultural associations, schools, policy makers and individuals in an exploration of heritage, cultural memory, and educational practices, carrying out work in the UK, Italy, South America, Australia, Ethiopia, the USA, and Namibia. TML published Policy Report which calls for the reframing of the study of MLs in Higher Education in the UK and, more broadly, of approaches to the study of languages and cultures. Posted in Announcements, policy, report on September 30, 2018 by cleurope. Posted in Announcements on September 30, 2018 by cleurope.